Cough is a defensive reflex of the body that functions to keep the airways clear of irritating or obstructing substances so that breathing and intake of oxygen is effective. Coughing occurs when the body wants to clear something from the airways. Foreign objects, dust, smoke, irritants, mucus or particles of food stimulate receptors in the airways send signal to the brain that start the coughing reflex. Viral – induced lower respiratory tract infections. Post-nasal drip resulting from rhinitis or sinusitis. Throat - clearing secondary to laryngitis or pharyngitis. Post-nasal drip secondary to nasal or sinus disease. Asthma, where cough may be the principal or exclusive clinical manifestation. Gastro-oesophageal reflux (may require ambulatory pH monitoring or a prolonged trial of anti reflux therapy to diagnose. Dry hacking cough - A short, weak repeating cough, often caused by irritation of the larynx by a postnasal drip. Barking cough - Also called Croup. It is a viral infection that results in swollen vocal chords and throat. Whooping Cough - Another name for pertussis, an infection of the airways caused by the bacteria Bordetella pertussis.The patient coughs continuously, after which there is a characteristic whoop sound and strong intake of a breath. A productive cough produces phlegm or mucus (sputum). The mucus may have drained down the back of the throat from the nose or sinuses or may have come up from the lungs. A productive cough generally should not be suppressed-it clears mucus from the lungs. Common cold: A wet cough with a runny nose, sneezing, watery eyes, low-grade fever (below 101.5°F), and postnasal drip (mucus running down the back of the throat).Symptoms can last from 2 to 14 days, but most people recover within 10 days. Expectorants, such as guaifenesin, can help you "cough up" or expectorate the mucus. Antitussives, such as dextromethorphan, can be used to treat the cough. 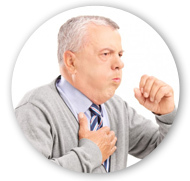 Chronic Obstructive Pulmonary Disease (COPD)/Chronic Bronchitis: A wet cough with mucus, shortness of breath, tightness of the chest, and wheezing. It is caused by Cigarette smoking or other long-term exposure to air pollutants or lung irritants. COPD is a life-long condition and requires medical care. Cough suppressants or antitussives (dextromethorphan, codeine, noscapine) stop the body's urge to cough by inhibiting the cough reflex. They are used for dry coughs only. Expectorants (guaiphenesin, bromhexine) decrease the consistency of thick sputum thereby making it easier for the person to bring out phlegm. Mucolytics (sodium citrate) chemically alter the consistency of thick secretions.